Cariñena may not be very well known, but according to Wine Enthusiast, it is the “region to watch.” Located in the heart of the Ebro Valley, between Barcelona and Madrid, in Spain’s northeast region of Aragón, Cariñena is the birthplace of the garnacha grape and the second oldest wine region in Spain after Rioja, receiving its DO status in 1932. I was introduced to this up-and-coming region at the recent Wine Bloggers Conference in Santa Rosa. Miami-based wine educator and writer Lyn Farmer led the seminar covering what he says is one of his favorite regions. Cariñena, in addition to being its own appellation, also has its own grape variety, cariñena. Tight clusters with thick skins and thick stalks, the resulting wine has high acidity, medium tannins and alcohol, medium plus body and a deep red/purple color. 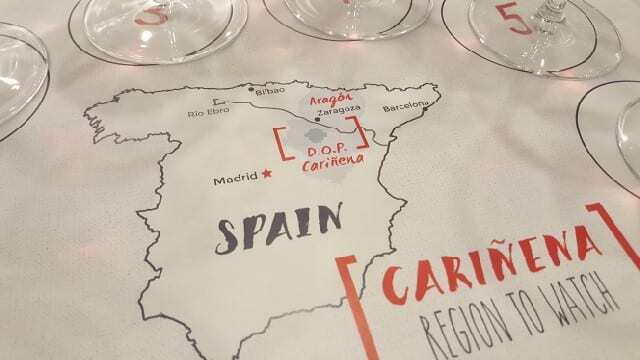 Cariñena typically has aromas of raspberry, cranberry sauce and spice (cinnamon and star anise). As this wine ages, it can develop notes of cured and smoked meats. Cariñena is also home to the highest concentration of old-vine garnacha. The garnacha grape produces typically large berries with thin skins for a moderate color wine, low acidity and high sugar resulting in high-alcohol wines that are full-bodied with soft tannins. Garnacha can make full reds to rosé, but it needs a hot climate to ripen and Cariñena is ideal. Typically consumed young, garnacha has red fruit notes, such as strawberry and raspberry jam, but as garnacha ages it develops leathery notes. Located at an elevation of 1,300-2,800 feet, Cariñena is a flat region that sees extreme temperatures from day to night. The strong dry Cierzo winds cool and protect the vines against wine disease. The 40- to 50-year-old vines, with their extensive roots that act as water reserves, are planted in stony soils. Hot summers, dry weather and diurnal shifts are ideal for the late-ripening grapes garnacha and cariñena. There are 1,800 growers in Cariñena and each are members of various co-ops, selling their grapes to central wineries. The wines of DOP Cariñena are flavorful, fruit-forward wines that come at a great value! Just look at the wines we tasted and their great value! Grandes Vinos y Vinedos – Founded in 1997, it is made up of 700 families of winegrowers. — El Circo 2016 Garnacha ($9) – This unaged wine has aromas of strawberries, raspberry leaf, dried lavender and a hint of menthol. — 3C Premium Selection 2012 Cariñena ($20-$25) – Aged for five months in new French oak, this wine has ripe fruit, floral and spicy notes. — Bodegas Paniza – Founded in 1953 and made up of 400 growers and 6200 acres of vineyards. — Viñas Viejas de Paniza 2012 Garnacha ($15) – The garnacha comes from 100-year-old vines. The wine is aged for a minimum of six months, resulting in a wine with raspberries and black cherry, as well as coffee, notes. — Artigazo 2009 Garnacha (40 percent), Syrah (30 percent), Cabernet Sauvignon (30 percent) ($17) – Made with the best grapes from the oldest vineyards at the highest altitude, this wine has aromas of wild red fruits and nuts and beautiful acidity on the palate. — Bodegas San Valero – Established in 1944, this is the oldest winery in Cariñena and consists of 700 growers and 8600 acres of vines. — Particular 2016 Garnacha Joven ($12-$14) – An unaged wine made from vines that are 15-25 years old, this wine is bright with intense fruit notes. — Particular Centenarias 2012 Garnacha ($25-$25) – Aged for 12 months in barrel and 18 months in bottle and made from grapes from 80- to 100-year-old vines, this elegant wine is full-bodied with red fruit aromas. 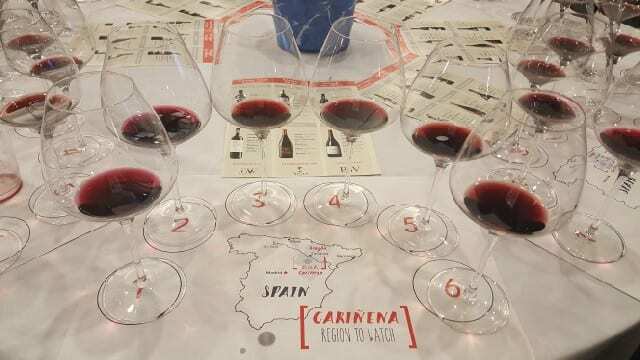 This entry was posted in Wine and tagged Carinena, garnacha, Grenache, Lyn Farmer, Napa Valley Register, Spain, Spanish wine, Wine, Wine Bloggers Conference by Allison Levine.